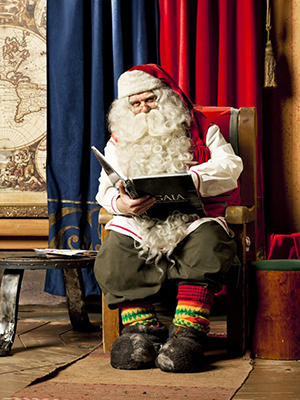 Does Father Christmas live in Finnish Lapland? I write a column about booze every other week for a major newspaper, and I often travel outside of the country, sometimes simply to drink some type of alcoholic beverage that I will eventually write about in my column. I also happen to be a father of two young boys. It therefore may not come as a total shock to learn that I am regularly seized by the terrifying notion that I am the worst, most horrible parent in the world. These moments usually strike when, say, I am sampling a vintage port on a lovely Portuguese afternoon or tasting a Dutch gin a stone’s throw from Amsterdam’s Red Light District, and then suddenly realize that back home in New Jersey it’s early morning and my wife is likely getting the kids ready for school.